“Friday Fly” is a recurring column dedicated to a fly on the wall’s perspective on campus spots and daily life here at Pitt. This is the fourth installment. The Pitt News is not a typical workplace. For most of the students who churn out the daily paper, there is no such thing as a short shift at the office. In fact, as I stepped into the office on the fourth floor of the William Pitt Union during daylight hours, I could hardly even recognize the space as a student-run newspaper office at all. If you arrived at the doors of The Pitt News anytime in the afternoon, you would be greeted by a student at the front desk who could help you find who you’re looking for. Perhaps you want to speak with Denise Thomas, the office manager who handles hiring and payroll, or Harry Kloman, a journalism professor at Pitt and the newspaper’s adviser. But if you proceeded past reception, you would see empty, desolate cubicles illuminated by harsh fluorescent lighting. The only signs of life are the few people congregated around a desk for the “sned,” a daily meeting to compose the following day’s editorial. Almost all of the editors have articles taped to their cubicles, a celebration of their accomplishments, but the little things reveal the most about the editors who sit there. The Opinions Desk is home to a pair of flippers, a calendar of inspiring proverbs and a desk organizer that looks like a person sitting on a toilet. The News Desk has a picture of a pug, a press pass and a white board with story ideas. These decorations remain at night, but the cubicles they adorn come to life with the editors who sit inside them. The editors stare at the large computers in front of them, crafting and reshaping stories and columns slated to run the next day. As the evening wears on, the fluorescent lights are shut off and the office bathes in the ambient glow of the strands of fairy lights hung from the ceiling. The low lighting and lack of sunlight outside make the deadline seem sooner than it is, but not by much. John Hamilton, the managing editor, pinballs around the room from editor to editor, checking the status of the next day’s stories. One story falls through, and editors frantically check a “leftovers” folder in Google Docs for an emergency replacement. One editor begins contacting writers via Slack, a professional messaging network, to tell them about the change. The Copy Desk staff checks articles on Google Docs as they come in, chatting with each other to pass the time between stories. One writer inquires about the status of their story around midnight and finds the edits are finished — finally, they’re free to go home. Staffers yell back and forth over the cubicle walls to confirm whether a certain story is running in the news section tomorrow, too occupied to leave their desks. This job is not the usual 9 a.m. to 5 p.m. — it’s more like a 5 p.m. to 1 a.m. shift. Late at night, Rachel Glasser, the assistant layout editor, sits all alone in the production room, a space separate from the cubicles. 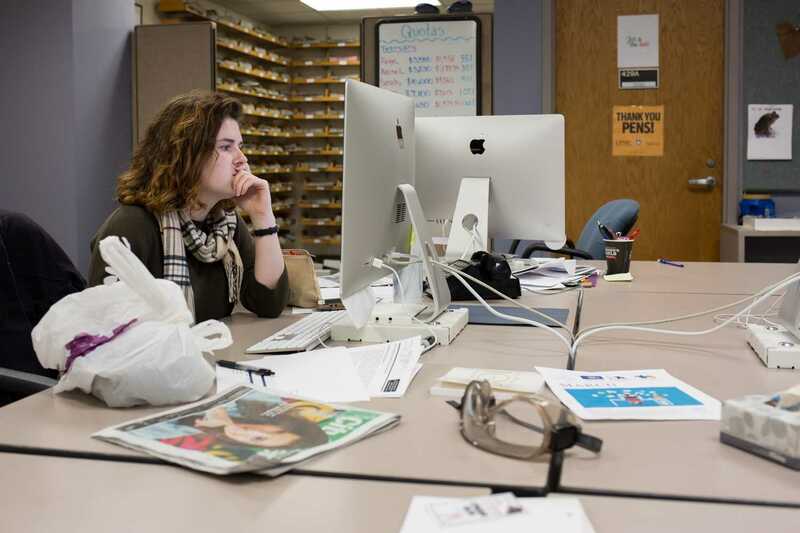 After each story passes through Editor-in-chief Ashwini Sivaganesh’s scrutiny, Glasser drops the story into InDesign, the program the newspaper uses for formatting the pages. She then adjusts the text to smoothly integrate onto the page. Editors already crafted the plan for tomorrow’s paper during “A1” earlier that evening, a time in which editors meet with Sivaganesh to talk about each section’s place in the next day’s paper. The layout editor manipulates a story to fill an appropriate portion of the page after she’s already placed headlines, illustrations, photos and advertisements. Thomas Yang, the visual editor, asks another editor about a column set to run later that week so he can determine whether it needs a photo or an illustration. Yang’s daily role at The Pitt News is a mix of delegating photo assignments to his staff and causing shenanigans around the office to entertain himself during the long night. After Sivaganesh and Hamilton give their final approvals on stories and make last-minute tweaks on headlines, the paper is finally ready for production. Section editors trudge home, exhausted, after a long day’s work as the clock pushes 1:15 a.m. The newspaper is sent to the press to be printed and then delivered to newsstands on campus before students re-emerge from their dorms and houses in the morning. The last editor out of the office clicks off the lights and locks the door. The cubicles are empty once more and only the decorations remain — until tomorrow.